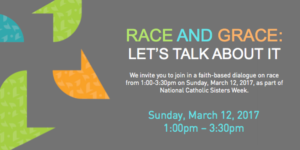 The Sisters of Charity Foundation of Cleveland, in collaboration with the Coalition with Young Adults and the Conference of Religious Leadership, will host an event titled Race and Grace: Let’s Talk About It on March 12. Focused on generating energizing intergenerational dialogue on race, the event is part of National Catholic Sisters Week. National Catholic Sisters Week is an annual celebration held in conjunction with National Women’s History Month. Its goal to honor and celebrate the lives, legacies and vital contributions of Catholic sisters. This year, National Catholic Sisters Week spans from March 8 to 14. The Sisters of Charity Foundation of Cleveland, which is committed to sharing the voices and stories of Catholic sisters and their ministries in Northeast Ohio, welcomes all to the free Race and Grace: Let’s Talk About It event. A special invitation is extended to Catholic sisters, associates and young adults in their 20s and 30s. Timing for the event is from 12:30 to 3:30 p.m. with an optional Mass at 4:00 p.m. The location is Mount Augustine / Regina Health Center, 5232 Broadview Road, Richfield, OH 44286. RSVPs are requested via eventbrite or coalitionyoungadults@gmail.com. Sponsors for the event include: Conference of Religious Leadership; Coalition With Young Adults; Sisters of Charity Foundation of Cleveland; Justice, Peace and Integrity of Creation Cleveland; Catholic Charities Diocese of Cleveland Diocesan Social Action Office; Diocese of Cleveland Office of Ministry to African American Catholics; and National Catholic Sisters Week.